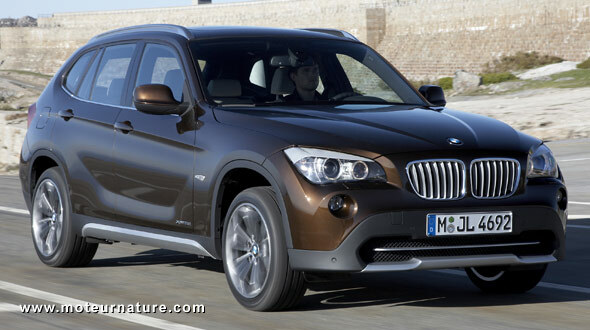 It’s not yet available in America, but the BMW X1 has been on sale for about a year in Europe, and it will the first BMW to receive the manufacturer’s latest engine: the Twin Power Turbo. This is a 2-liter 4-cylinder. That doesn’t sound impressive, but the technology certainly is, as this engine has a sophisticated twin-scroll turbocharger (the exhaust stream of each pair of cylinders are kept separate right up to the turbine wheel), and the very best direct fuel injection available. The solenoid injectors are centrally positioned between the valves, the best possible place, they operate with a maximum injection pressure of 200 bar to precisely control the supply of fuel. It goes out just ahead of the spark plug for a clean, and homogeneous combustion. This very precise injection allows a higher compression ratio than normally used on turbocharged engines, and that also helps efficiency. BMW’s Valvetronic system too, does quite a lot to reduce pumping losses. It’s even faster-acting now, thanks to an optimised stepper motor with integrated sensor. The results are impressive: 245-hp with 258-lbs/ft of torque at a very low 1250-rpm. This engine will replace a 3-liter six. The performances won’t change, but the driver will see the difference at the pump as the smaller engine will deliver a gain of 20% in fuel economy. Another good news comes with the car pricing. This new engine, will all that technology is clearly more expensive to build than the old one, even with two less cylinders. Yet the customer won’t have to pay anything more for it. The X1 28i with the new engine is available at exactly the same price as before. The U.S. will see this new engine very soon under the hood of the Z4 roadster, and BMW should follow that strategy, so don’t expect a price increase.